Lacking storage in your kitchen? Finding it difficult to fit everything into the drawers and cabinets? Sometimes, all it takes is a few clever storage tricks to create a kitchen that is more organised, runs more efficiently and makes life a whole lot easier. Here's 17 clever ideas to try! 1 | Use Lazy Susans/turntables in your cabinets to create easy access to all of your supplies. 2 | File folders are an inexpensive way to contain your family's water-bottles, and because they slide in and out, you can easily grab the one you want. 3 | A decorative tray is an attractive solution for storing your most-used cooking supplies and keeping them close at hand in the cooking zone. 4 | Divided dish racks are the perfect way to vertically store your baking supplies (rather than in a stack), and make them a whole lot easier to manage! 5 | Drawer dividers create a home for every little thing in your kitchen, so you can quickly find whatever you need in the middle of the food prep process. 6 | The back of a cabinet door is the perfect spot to attach some cork, magnetic sheeting, a whiteboard or a coat of blackboard paint. With this base, you can create a mini 'command centre', which removes all that clutter that tends to build up on counter-tops. 7 | Or use the back of the door to attach a wire basket to store chopping boards, or food wraps, or pantry items, or cleaning supplies... The options are endless! TIME AND ENERGY EVERY DAY! 8 | An under-shelf basket creates an extra layer of storage for smaller items - you could even use a few of these nifty baskets in a row to create a whole new shelf! 9 | Some simple hooks on the side of the cabinet (close to the stovetop) creates a hanging spot for your utensils, and frees up drawer space to store other kitchen items. 10 | Stackable containers in the pantry, fridge and freezer will maximize every inch of shelf space. And if you have containers that are air and liquid-tight, they'll also keep your produce fresher for longer. Clear containers make it easy to see exactly what you have, so you won't be wasting space stocking up on items you don't actually need. 11 | Clear baskets or plastic crates help create order and functionality in the freezer, and labels make it easy to find what you're after. 12 | Floating shelves on any available wall space are a great way to create instant storage. Pretty jars, canisters and baskets also add a decorative or colourful touch to your kitchen space. 13 | A tension rod under the sink is a clever solution for hanging cleaning supplies and utilising every inch of this awkward space. Add baskets for sponges and cloths and you'll be ready to clean anything! 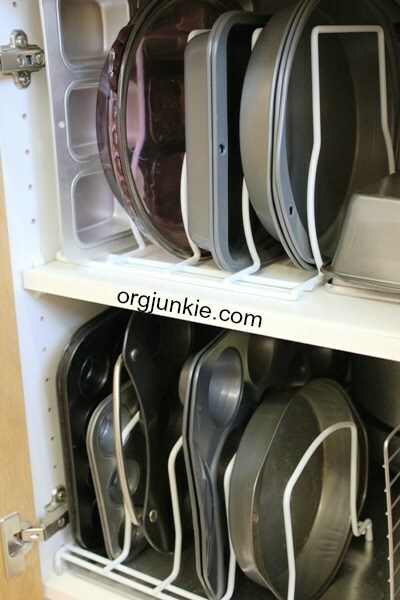 14 | Separate food storage containers from their lids, and stack by size and/or shape to gain extra drawer space, and make everything easy to find. An empty food container also makes a great storage solution for lids or smaller containers. 15 | A carousel is the best way to gain easy access to those items in the corner cabinet. Use it to store bulkier items, like pots and pans, food processor, blender and salad spinner. 16 | If spices are taking up a lot of space in your kitchen, consider giving them their own dedicated drawer instead. Store spices in airtight containers or jars with clear labels to make them easier to locate. 17 | Experiment with a range of multi-purpose bins inside a drawer to divide different food categories, such as potatoes, onions and bread. A HUGE AMOUNT OF TIME AND ENERGY EVERY DAY!